(Previously titled Dog Collar Chaos)Paris. Milan. New York. Franklin, Illinois? Aspiring design mogul and reluctant mob princess Lucie Rizzo dreams of taking the fashion world by storm. As the wisest of wiseguys will tell you, to go big, you have to start small. And a local charity fashion show provides the perfect chance to shine the spotlight on Coco Barknell.Not to mention the opportunity to work with the Don Corleone of pet products, Buzzy Sneider. But she didn’t earn that rank by being nice. Buzzy expects everyone to kiss her ring. When Coco Barknell designs start appearing on Buzzy’s website, Lucie wants to wring her thieving neck. 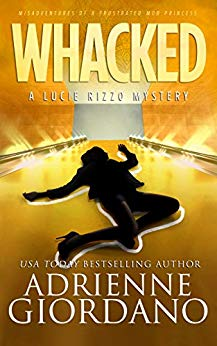 Until somebody beats her to it.A dead celebrity plus a very public feud can only add up to trouble for a girl named Rizzo. Except it’s not Lucie the cops put behind bars, but her BFF—hotheaded creative diva, Roseanne. The evidence may be stacked against Ro, but Lucie and her zany crew will never let her go down without a fight.